This riveting cinematic essay from legendary avant-garde performance artist Laurie Anderson is a punk meditation on love and death. The 68-year-old’s philosophical interrogation leads us through an intensely moving (yet not sentimental) journey beginning with the death of her piano-playing pet dog Lolabelle. Pondering safety and freedom, Anderson deftly glances off the terror of the American post-9/11 state and the construction of the US National Security Agency’s Data Center, then, two unprocessed childhood traumas later, lands us at the Buddhist concept of Bardo (the 49-day post-death period). Anderson’s mother is another major spectre in this story, while not mentioned but felt viscerally is the loss of her husband Lou Reed, who passed in 2013. Visually, it’s a mixed-media collage of her own animations and drawings, 8mm home movies, CCTV footage and static images. The imagery is as diverse as Anderson’s wide-ranging associative thought. Exquisitely compiled, the film is accompanied by a powerful, dense soundscape (composed by Anderson) and self-narrated in her gently measured, unique style. - Jo Randerson, NZIFF 2016. In the pantheon of memorable dogs in recent cinema - from The Artist show-stealer Uggie to Jean-Luc Godard’s Goodbye to Language star Roxy - one can now add Lolabelle, the late piano-playing rat terrier owned by Laurie Anderson and saluted in her stirring essay film Heart of a Dog. Though the 68-year-old performance artist hasn’t directed a movie since her 1986 concert film Home of the Brave, the new work is alive with the lyrical insights of a veteran artist. Using her beloved pooch as a starting point for broader philosophical observations, Anderson delivers a unique window into her creative mind. 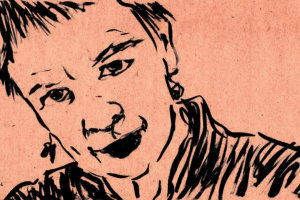 A collage of lo-fi video images, animation and still imagery, Heart of a Dog is narrated by Anderson as she recounts her relationship to Lolabelle and the dog’s own burgeoning musical career. Anderson managed to turn Lolabelle into an unwitting star readymade for an age of viral animal videos: She trained the aging pet, who went blind in her later years, to tap away at an electronic keyboard in conjunction with a beat. Performing at charity events (and even debuting the original composition Music for Dogs, an event co-curated by Anderson and her late husband Lou Reed, at the Sydney Opera House in 2010), Lolabelle took on greater significance for Anderson. As the filmmaker’s reflections on Lolabelle continue, she becomes an avatar for Anderson’s own views on life’s various mysteries. Heart of a Dog contrasts the absurdities of modern times with sweeping observations that dwarf such concerns. Using a personal style reminiscent of Chris Marker’s diary films, Anderson develops an eloquent treatise on the nature of canine obsession that dovetails into post-9/11 anxieties, ruminations on the afterlife, and the fragility of every waking moment. Her fragmented observations organically sway from warm nostalgia to utter dread. “As a child, I was a kind of sky worshipper,” she says early on, as the screen turns blue, setting the stage for a wide open investigation into the desire to understand forces just beyond human comprehension. But Anderson also applies her inquisitive style to a precise historical moment. Showing us her apartment’s view from downtown Manhattan, she recalls the weeks after 9/11 and the overwhelming sense of fear that permeated American society. Even on this tired subject, she finds a beguiling fresh take, linking the vapid Homeland Security mantra “If you see something, say something” to the existential writings of British philosopher Ludwig Wittgenstein. In moments like these, Anderson shows how even the most ephemeral aspects of the world hide deeper meanings. Through this process of intellectual examination, Anderson combines a melancholic yearning with warmer possibilities. Lolabelle’s fate at the hands of terminal cancer arrives in a tear-jerker montage that gives way to more vivid descriptions of the Buddhist afterlife, where Anderson imagines her late friend’s arrival. Rendered in expressionistic paintings and enlivened by Anderson’s vibrant score, Lolabelle’s 49 days in the Bardo (a purgatorial realm described in The Tibetan Book of the Dead) epitomize the sheer originality of Anderson’s perspective. The movie seems to sprout from her very consciousness, as she controls everything we see and hear; she invites her audience to ride the wave of her restless thoughts and grow comfortable with the poetic logic governing them. Haunting and celebratory at once, Heart of a Dog ultimately amounts to a contemplation of mortality. “The purpose of death is the release of life,” Anderson asserts, in one of several moments that hint at a bigger picture. With the artist as our guide, it’s impossible not to receive her observations about Lolabelle without considering Anderson’s other recent loss: Lou Reed, who died in 2013, remains off-screen and unmentioned for most of the movie. But as his music plays over the credits, Heart of a Dog concludes with the implication that there may be more personal dimensions to the project than its forthcoming director chooses to share. - Eric Kohn, IndieWire, 4 Sep 2015.